That’s what my daughter says when she has a great shot to post to Instagram. If your Instagram feed is all about the wow factor in your life then come see and share the fun and fantastic sights of Bishop and the Eastern Sierra. 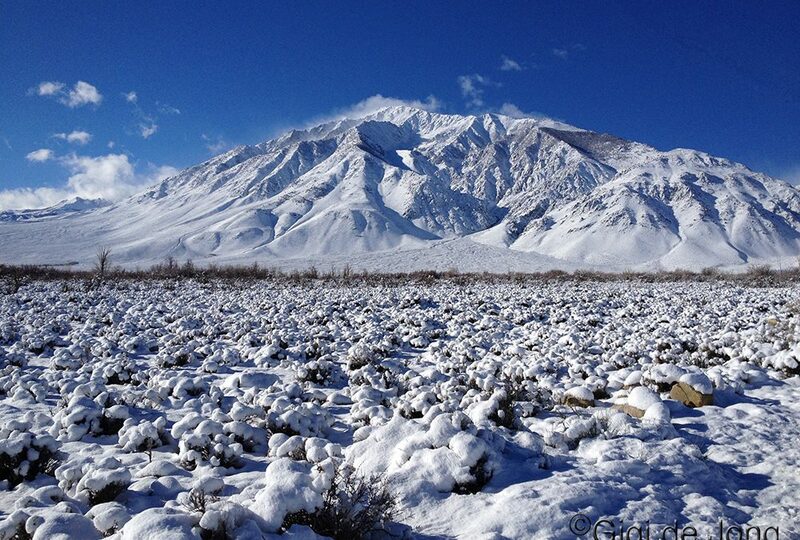 The Eastern Sierra is one of the most photographed regions of California. First time visitors to the area are awed by the grand landscape – the majestic peaks that rise to 14,000 feet snow capped in winter, the rich colors in fall, the blanket of wildflowers in spring, the dramatic sunsets, and the sparkling night sky. There are countless ways to enjoy the outdoors, a great variety of activities to do in and around town and special places to experience to make your visit to the Eastern Sierra uniquely yours. Whether you’re a couple of lovebirds ready for romance, or on your own in search of adventure, or here with your little ones looking for family fun, what better way to share your experiences and preserve the memories than posting them to Instagram? Here are 11 … out of a gazillion more you might find for yourself … of Instagram‑worthy locations and things to see and do. Note that some of these places will only be accessible during the warmer months of the year, so be our guest as often as you can. 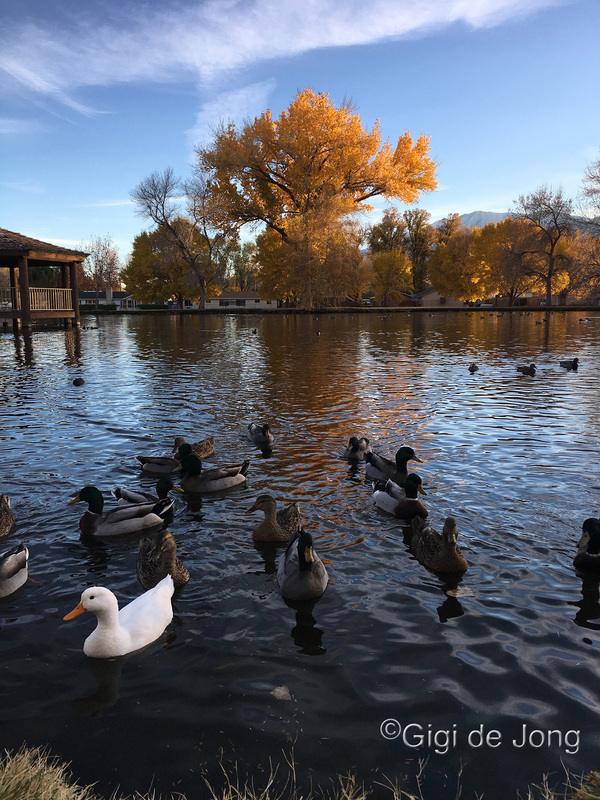 Begin your tour of Bishop and surrounds at the Bishop Visitors Bureau, at 690 N. Main St. located in the beautiful Bishop City Park. The friendly and knowledgeable staff will take the time to chat with you and help you find just the right kind of adventures for you and your group. You can pick up maps, get good directions, and find where to stay, eat, and experience the best of the Eastern Sierra. Residents and visitors frequent the park throughout the year and many wonderful events are held under the spreading shade trees of the park grounds. Within the 44 acres of parkland the city maintains a swimming pool (open from Memorial Day to Labor Day), baseball fields, tennis courts, a skate and bike park, an off-leash dog park, picnic tables and gazebos, a beautiful pond, children’s play structures, outdoor fitness center and bocce court. It’s here too that you can purchase a bag of nutritious feed for the ducks that cruise the creek and swim in the lovely park pond. Feed the ducks and feed your social media. A mile and a half south of Bishop is the “jail” at Brown’s Town Campground. This quaint structure is part of the western town scene that depicts how life was once lived in these here parts. Put on your boots and hat, pardner, and don’t let yourself get captured … except on camera. It’s your ‘get outta jail free’ card. Silent and steadfast, Mt. Tom is the prominent peak that dominates the western skyline. With its classical inverted triangle shape, it rises almost 10,000 feet vertically from the base to the top and is the iconic image of Bishop. There’s the long view from the lovely promenades along the Bishop canals just east of town, to the close up view from the quiet roads in Round Valley, to the high view from the overlook on US Highway 395 just north of Bishop. Any way you look at it it’s a soul stirring vision. Present yourself to this monument of nature bearing gifts of locally made food and drink and offer it up to Mt. Tom. Take the shot, post the proof, then eat and drink that deliciousness yourself. If you haven’t sampled all there is to eat and drink in Bishop then take a look at this previous blog, A World of Good Food in the Eastern Sierra, to whet your appetite. Ring the train bell in Engine No. 9 at Laws Railroad Museum and Historic Site. This museum and extensive outdoor site is a beautifully preserved reminder of the small, once lively town of Laws and the railroad station it served. In addition to the train engines and cars, many original buildings – salvaged and restored, and thousands of weird and wonderful artifacts, it has a section of working track and functional railroad cars. 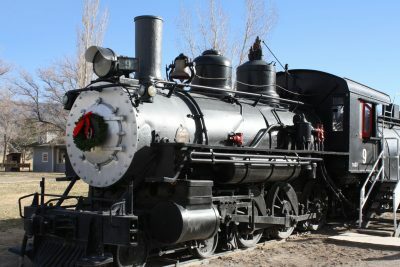 This museum complex safeguards the memories and experiences of a not-so-long-ago era of railway magnates, miners, farmers, fortune seekers, high Sierra adventurers, and travelers who rode the rails through the Owens Valley. Transport yourself back in time. Climb aboard a vintage train engine and ring the bell. Preserve and share your experience with a photo for the future. Read more about the Owens Valley railroad in a previous blog, 300 Miles Too Long Or 300 Years Too Soon. Deep in Pine Creek Canyon, behind Mt. Tom, the Gable Lakes trailhead is located in old groves of tall pine trees at the head of the canyon. This spectacular canyon has many claims to fame. It is a magnificent example of a glacial canyon exhibiting the distinctive features of glacial valley formation, such as the typical U-shaped head bounded by high steep walls. It is the site of an old and once very productive tungsten mine that reached high up into the mountains, often referred to as the “Mine in the Sky.” And it is here that alpine habitat is close to Bishop and easy to access by car. 30 Miles north of Bishop is Crowley Lake. It was created by the Long Valley Dam, which was built in 1941 for water storage and flood control. Since the creation of this reservoir a fascinating and unique natural feature, obscured for thousands of years under the earth, was exposed. 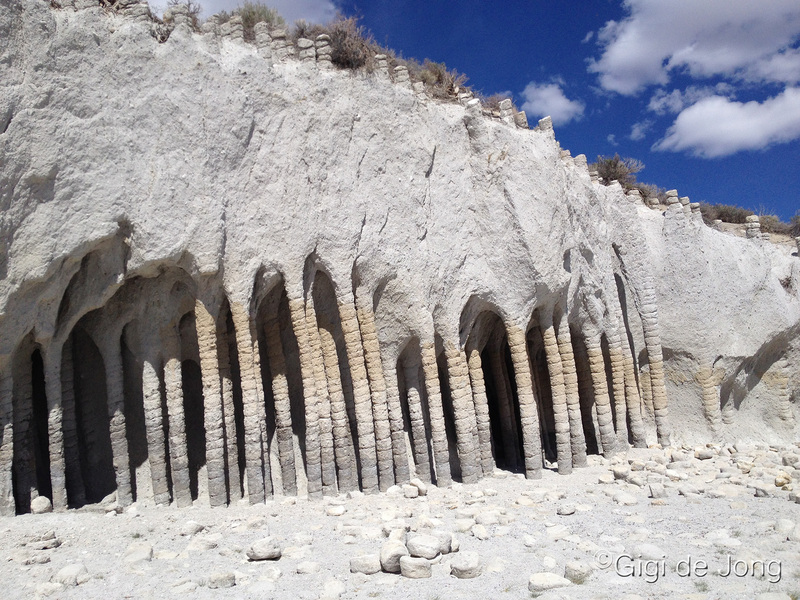 Access to the pillars is by boat, on foot, or 4×4 vehicle and then only in the warmer months of the year when lake is not frozen and the ground not covered in snow. If you have the time and tenacity to visit this incredible place make sure you document your discovery and post a pic to Instagram. The dam at Lake Sabrina (pronounced Suh-BRY-nuh by locals) was built in 1907-08 on the middle fork of Bishop Creek at just over 9,000 feet above sea level. The lake was named after Mrs. Sabrina (suh-BREE-nuh) Hobbs, wife of C.M. Hobbs first General Manager of California Nevada Power Company, which built the dam. When and why the pronunciation morphed to Suh-BRY-nuh in later years is not known. A quaint café and beautiful boat landing alongside the dam are open and accessible by road from spring to fall each year. The homemade pie and ice cream are most definitely worth the trip – not to mention the gorgeous scenery, the great fishing, the boat rentals and fine hiking trails. The lake level fluctuates seasonally and annually, but the beauty of the area never diminishes. From Bishop head west on US Highway 168 (W. Line St.) for 19 miles to reach the lake. It’s a fine dam site to see. Buttermilk Country is considered by many to be the best bouldering area in the country. It is certainly California’s premier bouldering area and entices many of the world-renowned heroes of climbing. The boulders here are known as glacial erratics. Huge rocks plucked from the Sierra Nevada 4 miles away, and driven by glaciers across this landscape some 2.5 million years ago. Some boulders are more than 40 feet tall. On a drive out west along Buttermilk road Grandma and Grandpa Peabody are the first large boulders you will encounter along the drive. At about 55 feet tall, they are also two of the largest boulders anywhere and well respected by the best climbers. Perhaps you don’t boulder, but you are bolder than the average traveler so go and visit the old folks. You might see some young folks attempting the challenging routes on these rocks. Give them a hug – the old folks and the young folks. Show the love. Oh, and on your way there … make like a flag and fly. It’s a popular climbers’ challenge to do a lateral support on the Buttermilk rd signpost. Are you strong enough to rise to the challenge? 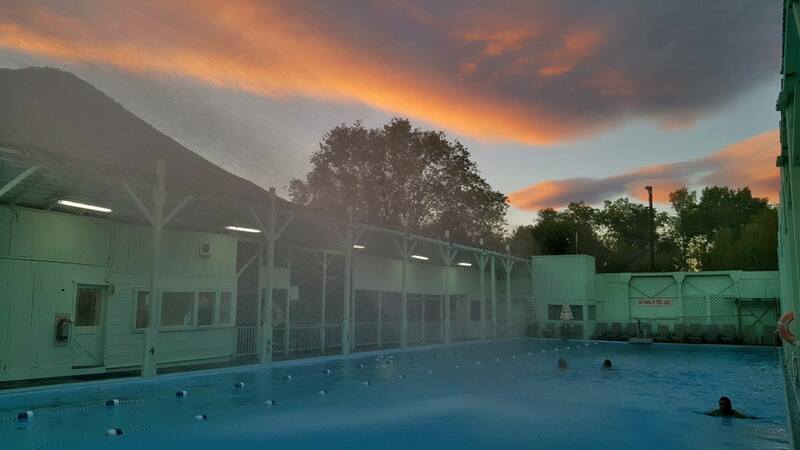 Keough’s Hot Springs is a marvelously soothing and fun hot spring resort, 8.7 miles south of Bishop, founded by Phillip Keough in 1919. The resort harks back to its bygone era with much of the original wooden structure intact. The two pools, a large swimming and a smaller soaking pool, are the original ones built in 1919 and have a constant flow of fresh mineral water. The large pool, which measures 100’ long by 40’ wide, is great for lap swimming or just splashing and floating. The hot pool is kept at an even 104 deg F and is perfect for easing muscles and soaking away stress. Cardinal Village was built at the turn of the 20th century to serve a small gold mine a short distance away. For about 30 years the Cardinal Gold Mine changed ownership several times and eventually closed in the late 1930s. In 1946 the village was turned into a resort and has been serving guests ever since. A short hike from the resort, or guided horseback tour, will take you to the rustic ruins of a real old California gold mine. The resort is located at the edge of the little settlement of Aspendell, 17 miles west of Bishop on US Highway 168 and just 2 miles from Lake Sabrina. The golden time to visit this mine is in fall when the leaves are turning and the sun is still warm, but spring and summer are marvelously rewarding too. Get it? Got it! Golden. Come back to the Bishop Visitor Center and show us your photos and tell us about your experiences. We love hearing about our guests’ adventures. Get your free Bishop or 395 sticker and razzle dazzle your instagrazzle. Okay, Instagram it.